Florida Default Law Group this week sent out a wave of bizarre “Notices” in many of its foreclosure cases, to “withdraw” affidavits Florida Default Law Group filed as evidence in various foreclosure cases. Are Jeffery Stephan Affidavits False? The affidavits in question were signed by a man named Jeffrey Stephan, who claimed in various cases that he had “personal knowledge” of the facts of thousands of foreclosure cases—an impressive memory, if true. 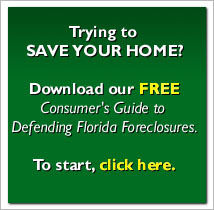 Foreclosure defense lawyers have known for a while that Florida Default Law Group has a problem filing inadmissible affidavits. But the “Notice” itself is a stunning admission of massive fraud by Florida Default Law Group [PDF]. The Notice says, Pursuant to Rule 4-3.3, Rules of Professional Conduct… the undersigned law firm has recently been notified that the information in the Affidavit may not have been properly verified by the Affiant; and accordingly, the Affidavit is hereby withdrawn. (4)	offer evidence that the lawyer knows to be false. A lawyer may not offer testimony that the lawyer knows to be false in the form of a narrative unless so ordered by the tribunal. If a lawyer, the lawyer’s client, or a witness called by the lawyer has offered material evidence and the lawyer comes to know of its falsity, the lawyer shall take reasonable remedial measures including, if necessary, disclosure to the tribunal. A lawyer may refuse to offer evidence that the lawyer reasonably believes is false. In other words, Florida Default Law Group has withdrawn the affidavits because it now cannot dispute the affidavits are false. When Did Florida Default Law Group Learn That Its Evidence Was False? On its face, this seems reasonable: a lawyer relies on a witness to tell the truth, and later discovers the witness was not telling the truth, and withdraws the witness. But the question here is how recently —their word, not mine—Florida Default Law Group learned that the Stephan Affidavits were not properly verified . We know that the Ice Legal team took Stephan’s sworn testimony in a deposition last December, and others have taken his deposition since then. In those depositions, Stephan admitted that he really had no personal knowledge of anything he swore to in those affidavits. Wasn’t that enough? If not, what smoking gun did Florida Default Law Group just discover that they’re not sharing with the rest of us? Frankly, it shouldn’t have taken nine months for them to pull all these affidavits in the first place. But even that isn’t the real problem. Under oath, Stephan admitted that he signed as many at 18,000 foreclosure affidavits per month. Not all of those cases are still active—many of those foreclosure cases have already gone to sale. That’s hundreds of thousandsof families cast on the street through falsified evidence. Hundreds of thousands. Jeffrey Stephan is a one-man homeless crisis. All of these sales, all of these judgments, should be set aside for fraud on the court. Florida Default Law Group had better make sure its insurance premiums are paid up, because a thermonuclear class-action suit can’t be long now.